With the frenzied fracking boom in North Dakota oil, a family’s mineral rights become suddenly valuable, bringing questions and challenges to a daughter who cares about the costs to the land. What does an environmentalist do when she realizes she will inherit mineral rights and royalties on fracked oil wells in North Dakota? How does she decide between financial security and living as a committed conservationist who wants to leave her grandchildren a healthy world? After her father’s death, Lisa Westberg Peters investigates the stories behind the leases her mother now holds. She learns how her grandfather’s land purchases near Williston in the 1940s reflect four generations of creative risk-taking in her father’s Swedish immigrant family. She explores the ties between frac sand mining on the St. Croix River and the halting, difficult development of North Dakota’s oil, locked in shale two miles down and pursued since the 1920s. And then there are the surprising and immediate connections between the development of North Dakota oil and Peters’s own life in Minneapolis. 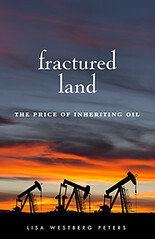 Catapulted into a world of complicated legal jargon, spectacular feats of engineering, and rich history, Peters travels to the oil patch and sees both the wealth and the challenges brought by the boom. She interviews workers and farmers, geologists and lawyers, those who welcome and those who reject the development, and she finds herself able to see shades of gray in what had previously seemed black and white. Lisa Westberg Peters is the author of many children’s books, including several geology-related titles. Trained as a journalist, she now works as an academic writing tutor at Metropolitan State University in St. Paul.